Jump to weighed contest grade sheet balsa. 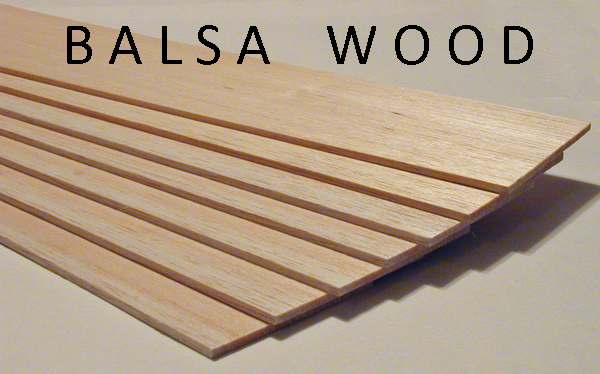 To help the builder select wood best for constructing a strong, light flying model we started color coding our balsa wood. Each sheet of balsa is weighed, categorized and painted according to our color code. This wood is used to create our strip wood so you need to understand that strip wood pieces are not weighed individually and may vary because ’Mother Nature’ creates variation in density across the sheet. There may be some differences and the builder must still decide if it is appropriate. Every builder has their own technique, understanding where they need strength for how they fly and should feel free to build accordingly. PINK = 4 - 6# BALSA STOCK. Best used where strength is not needed; great for filling in areas; suggest using for head rests, wheel pants, landing gear struts when reinforced with wire; detail features on scale models. YELLOW = 6 - 8# BALSA STOCK. This works great for competition models and may require the builder to be comfortable with delicate strip wood in the smaller sizes. Best used for stringers in the smaller sizes, trailing edges, formers, ribs and tail structures. RED = 8 - 10# BALSA STOCK. This is the best all around general construction wood for most modelers because of its inherent strength and moderate weight. Competition modelers will tend to limit their top weight to 8-10#. It is good for stringers and parts where strength is needed. Works well for critical longerons and formers, leading edges, and wing spars. ORANGE = 10 - 12# BALSA STOCK, and BLUE = 12-14# BALSA STOCK. We recommend the use of 10-12# and 12-14# weight classes where strength is the objective. You must be very selective when and where you use these weight categories as it adds up quickly and we know weight affects flight performance. Builders that struggle with light weight stringers should consider working more with these weights. 1/20" x 1/20" x 18"
1/20" x 1/8" x 18"
1/16" x 1/16" x 36"
1/16" x 3/32" x 36"
1/16" x 1/8" x 36"
1/16" x 3/16" x 36"
1/16" x 1/4" x 36"
1/16" x 3/8" x 36"
1/16" x 1/2" x 36"
3/32" x 3/32" x 36"
3/32" x 1/8" x 36"
3/32" x 3/16" x 36"
3/32" x 1/4" x 36"
3/32" x 3/8" x 36"
3/32" x 1/2" x 36"
1/8" x 1/8" x 36"
1/8" x 3/16" x 36"
1/8" x 1/4" x 36"
1/8" x 3/8" x 36"
1/8" x 1/2" x 36"
3/16" x 3/16" x 36"
3/16" x 1/4" x 36"
3/16" x 3/8" x 36"
3/16" x 1/2" x 36"
1/4" x 1/4" x 36"
1/4" x 3/8" x 36"
1/4" x 1/2" x 36"
Hand-sorted contest balsa in 3 density ranges, color coded on the end of each sheet for easy recognition. Pink, our lightest (4-6#); Green (6-8#); and Red, stiffest (8-10#). Sold by the sheet. A B or C grain. A B grain wood is not separated, so you may not specify which one. C grain subject to availability. Our lightest balsa may have some mineral stains, although we try to minimize it. 1/32" x 3" x 36"
1/20" x 3" x 36"
1/16" x 3" x 36"
3/32" x 3" x 36"
3/16" x 3" x 36"
1/4" x 3" x 36"
3/8" x 3" x 36"
1/2" x 3" x 36"
Click on the picture to go to our aircraft plywood page. 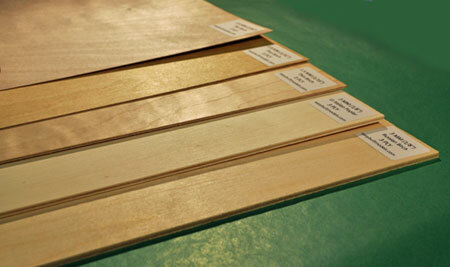 EBM Aircraft Plywood is the finest aircraft grade plywood. Available in thicknesses from 1/64" to 1/8" (0.4MM to 3MM).